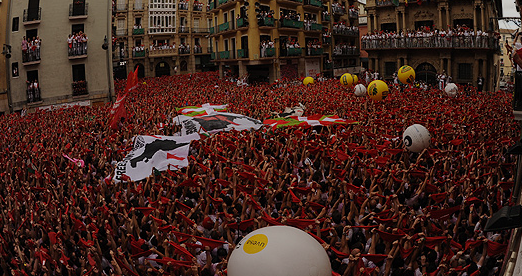 The San Fermín festival, one of Spain’s most famous festivals, took place in Pamplona. Tens of thousands of people attended the nine-day event. The festival is held every year and starts at noon on July 6 after a rocket is fired from the city hall. Every morning of the festival, hundreds of people run in front of 6 fighting bulls in narrow streets usually wearing the traditional dress of white shirts and pants with red sashes. The run lasts around 3 minutes, and is a bit dangerous. Every year, a few people get injured. Els Enfarinats is an annual festival celebrated in Spain on December 28. People dress up in military costumes and throw flour and eggs at each other. Another Spanish festival is the Human Tower Competition (Concurs de Castells) which takes place every two years. As the name describes it, people get on top of each other to build a tower. The Wife Carrying World Championship was held on July 5 in Sonkajaervi, Finland. A man carries his female teammate and runs through an obstacle course which includes water, sand, and more. The Championship has been held every July in Finland since 1992.